UNITED NATIONS, December 7 -- In Burundi, how many extrajudicial executions have there been this year? Human rights groups say over 300, but the UN on Wednesday put the number at 57. Inner City Press asked UN envoy Karin Landgren to explain. Inner City Press: on Burundi; there is a report by a coalition of human rights non-governmental organizations there saying that the Government has killed up to 300 surrendering FNL [National Liberation Forces] or demobilizing rebels in the last five months. Given the UN’s engagement in Burundi, what does the UN think of that report and what’s being done to prevent these retaliatory killings? Spokesperson: I’ll have to check, Matthew. I don’t have anything on that. The UN continues to be concerned about reports of extrajudicial killings in Burundi, including of people affiliated with opposition parties. The United Nations Office in Burundi has raised this concern regularly with the Burundian Government, and has urged the Government to take measures to prevent such killings, to investigate all such cases and to hold to account those found responsible. But how many extrajudicial executions have there been? Briefing an open meeting of the UN Security Council on December 7, Mr. Landgren put the number at 57. After she spoke with Council members in closed door consultations, Inner City Press asked, and Ms. Landgren exclusively responded to, three questions. Inner City Press asked about the difference between 300 and 57. Ms. Landgren said "We've asked them to give us documentation on their number. The fifty seven are the cases BNUB itself has documented. If they can give us more on their number, we will look into their number." Landgren said, "Things are broadly on the right track." Inner City Press asked her about a new rebel group, Le front de restauration de la democratie (FRD) led by Pierre Claver Kabirigi." She replied, "A couple of group announcing themselves, some cross border from DRC and Tanzania. The government made arrests following attacks from across the border in Tanzania. We are emphasizing to the government and opposition groups that there needs to be an end of violence." 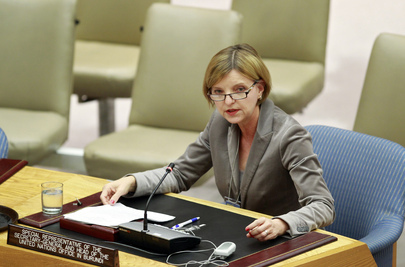 Landgren previously served as UN envoy in Nepal, from which two weeks before the UN mission's mandate was to end, Secretary General Ban Ki-moon reassigned her to Burundi, replacing Charles Petrie. Click here for that. Inner City Press asked if those being killed -- whether 57 or 300 -- are FNL members who were asked to demobilize, or others opposed to the government. She replied, "It's hard to say people opposed to the government. The pattern among the fifty seven... [they are] members of political parties that are extra parliamentary." After Ms. Landgren left, Inner City Press asked this month's Council president Vitaly Churkin of Russia about those being killed in Burundi. Churkin said, "Absolutely... I can tell you that the Russia delegate wants strong language in the draft resolution on this." Watch this site.